Lucent Technologies makes telecom Internet access concentrators, high-speed access equipment, and access routers at it's modern manufacturing operation in Alameda, Calif., just outside of Oakland. The facility was designed with growth, ergonomics, process control, and high productivity in mind. It features production cells with multiple workstations for maximum flexibility and control. Each cell has it's own operator interface that adjusts conveyor routing with a simple drag and click operation. The operator-controlled conveyors used in these production areas link up with an elevated powered takeaway conveyor that efficiently transports the finished product through the shipping process. It's a fully integrated operation, supported by a network of Hytrol conveyors. The flow of materials and components through the 100,000 sf facility is streamlined and ergonomic. Powered conveyors move the equipment on conveyable pallets to one of the three production cells, replacing the manual handling and forklift movement that used to take place. Productivity has increased significantly at the Alameda facility thanks to the upgraded conveyor system. 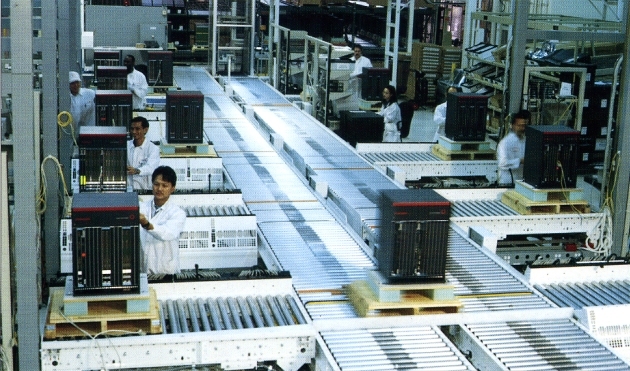 The new production line alone produces more than 85 units during a one-shift period. 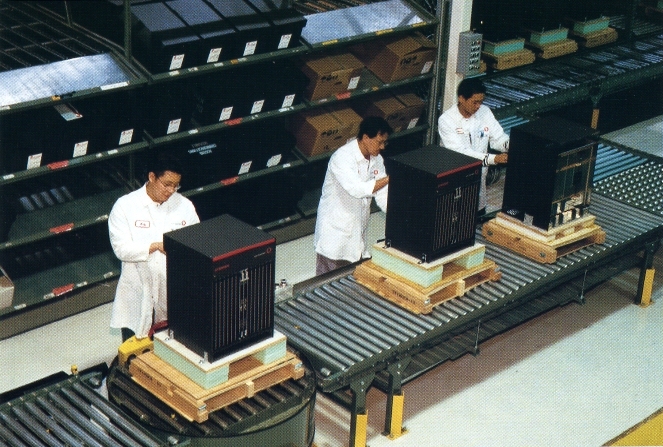 And that includes an hour and one-half of testing on average for each unit to ensure highest product quality. The new system also has greatly alleviated congestion throughout the plant while at the same time minimizing manual handling and forklift movement. This reduction in manual activity has another very important benefit: it minimizes the risk of injury that can come from lifting and handling a heavy piece of equipment. Lucent already has realized a number of important benefits-and they promise only to increase in the future The system was designed to be fully responsive to future increases in production demand that are almost certain to come. In addition to expanding the number of workstations in the new production cell, Lucent has the option of adding a whole new production line. In short, the Alameda facility is well positioned to respond to current and future demand.